The number of LNG bunkering vessels has grown from one at the beginning of 2017 to six in early 2018, with these numbers expected at least to double by 2020, multi-sector industry coalition SEA\LNG said. Furthermore, it is forecast that in the next five years 30 LNG bunker vessels could be operating worldwide. ” The bulk LNG infrastructure is largely built, what remains is the last mile, in which the industry is showing a growing appetite to invest,”Peter Keller, SEA\LNG Chairman, said. The interest in LNG as marine fuel is growing especially ahead of the entrance into force of IMO’s 2020 global sulphur cap. 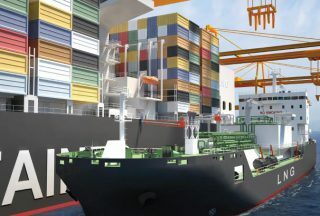 “To effectively incentivise the developments needed to realise a competitive global LNG value chain for cleaner maritime shipping by 2020, we need to make the credible, fact-based case for LNG as a marine fuel to the shipping industry – which includes investors, bankers, shipping lines, bunkering companies, ports, and other enabling stakeholders such as shippers, governments, regulators, and local communities,” Keller added. LNG eliminates both SOx and PM emissions and reduces NOx by up to 90 pct. However, important questions relating to the global warming implications of methane emissions in natural gas production and transportation as well as methane slippage in marine engines remain. SEA/LNG said it was working on bringing clarity on the investment in LNG by providing shipping lines with an analysis of the qualitative factors that should help to inform them on new build investment decisions. What is more, data is being developed on the available and planned LNG infrastructure to support shipowners’ plans to invest in LNG. The association believes that once the fact base is set out in a clear and credible manner for the global shipping industry, LNG will move from the ‘chicken and egg’ to the implementation phase.